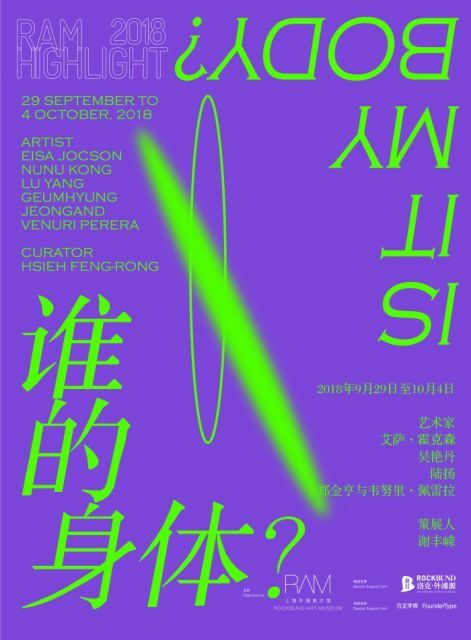 From Sep 29 to Oct 4, 2018, the annual special project RAM HIGHLIGHT 2018: “Is It My Body?” will be launched at the Rockbund Art Museum (RAM) Shanghai. Following from the successes of the first edition in 2016, “Zhang Ding: Devouring Time”, and the 2017 edition, “Displace”, RAM Shanghai will continue to challenge the boundaries of conventional exhibitions and invite the public to participate and interact with the works. Visitors will be able to enter a multi-dimensional art space blending exhibition, concert, performances, workshops, lectures, and other experiences together. “Is It My Body?” is curated by senior curator Hsieh Feng-Rong, who invites four artists or collectives from diverse fields that encompass drawing, painting, performance, video and real-time motion-capture technology. The focus is on how visuality dominates our living habits and modes of thought, therefore transforming the means by which humans perceive their own bodies and this transforms relationships between people. For Hsieh Feng-Rong, “We are situated in an age where consumer culture is highly developed, our lives are filled with all manners of social spectacles constructed by various symbols. The popularization of smartphones, in particular, has accelerated and stimulated modes of thought to become centered on visuality; the cognition and imagination of the body has been weakened as a consequence. This project, through the artists’ practices, does not seek to fundamentally change people’s existing views of the body. It hopes to raise people’s awareness of the above-mentioned phenomenon. Furthermore, this project, with artistic practices as ways of cultural researches, attempts to open up new understandings of the body and how new concepts of the self might emerge along with these new horizons.” Are people ever more reliant on visuality in capturing information and thereby neglecting other faculties? However, the interaction between body and its environment always brings into play the manifold senses, which synthesizes together with the subjective body in order to generate perceptual experiences. “Is It My Body?” attempts to shift towards the body’s other perceptual systems, reflecting on questions regarding however different levels of the body and probing an array of issues relating to the body and subjectivity. This includes among others: identity politics, the standardization of bodies under cultural economic influences, dysfunctional bodies, the consumerization of the body, the relationship of body and space, neurology, subculture and the tension between being controlled or controlling the body. There are four works featured in the exhibition. Eisa Jocson transforms into Snow White and interprets Princess Studies with her partners. In 2005, the Hong Kong Disneyland opened with large numbers of performers from the Philippines employed to repeat formatted performances of “happiness” as their daily labor. However, they are often excluded from the main roles and instead assigned to supporting roles. The artist’s performance subverts this accepted convention, interpreting Snow White with her non-white body and deconstructing this classic body icon. Nunu Kong has organized three experimental performance workshops, which she will personally lead and demonstrate to participants movements related to the issue of the “body”. For instance, in Multi-Dysfunction, the constraints and limits of the participant’s body is used to emphasize intuition; or with the work Extraction, where a special high-intensity cardiovascular training is arranged in order to extract perspiration from exercise in an exploration of whether the “consumption” of energy is lost or regained. Condition and Coordination meanwhile delves into the relationship between people and space, creating an “bodily narrative” of the individual. Electromagnetic Brainology! Brain Control Messenger! by Lu Yang draws on neurology, turning the relationship between body and the spiritual world into works integrating animation, otaku culture, game aesthetics—which the artist derives from divergent interpretations of the “body” from various cultures and religions. This time, the research team from Osaka University (“Galvanic Vestibular Stimulation”) quoted in the work is also invited to be present as a workshop in this exhibition. The public will have the chance to experience the odd sensation of controlling one’s bodily movement with a remote control. Venuri Perera and Geumhyung Jeong are adept at performing by using elusive and subtle relationships. The work Venuri n Geumhyung establishes a simple set of game rules, each time they carry out this rule, they continually interchange between moments where they either trust or doubt one another, and roles where the level of power also shifts constantly. RAM HIGHLIGHT is RAM annual celebration which has a strong focus on the creativity and experience in contemporary art by a dinner and special commissioned project for 8-15 days. The artist(s) will be selected according to their abilities to activate creative experiences related to their own art creation as well as their wish to shaken the space and the audience of the Museum. RAM offers the commissioned artist(s) an opportunity to conceive a powerful art statement in relation to the space and audiences of RAM. Courtesy of the artists and Rockbund Art Museum, for further information please visit www.rockbundartmuseum.org.